Aluminium anvil garden pruner: aluminum handles won't rust and the coated blade resists rust, extending the life of this tool. this anvil pruner has a single straight cutting blade to close down on the flat edge or anvil. this is much like when you cut on a cutting board. the textured anvil surface holds the branch in place to help you complete the cut. this anvil pruner is great for cutting tough, dead wood.textured blue rubber type handle surface provides a solid grip. easy locking close. This rugged gardener pruner is ideal for cutting tough stems and branches. 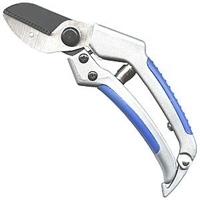 The contoured handle of the pruner makes it easy to grip and prune plants with minimum hassle. The aluminum blades help in smooth cutting and pruning and require low effort. We have years of experience working with gardening tools and instruments and we promise user satisfaction. With free shipping over bulk buying, we offer the best deals for quality gardening products. Our prices are extremely economical with a promise of highest quality material and best value for your money.